Concentrated pheromones in the center so your dog is drawn to the center. Bullseye Pee Pads specially design with concentrated pheromones in the center so your dog is drawn to the center. The Bulleye No Mess Pee Pads&apos; leak proof absorbent quilted material is filled with odor eliminating mico-locking beads that absorb and hold liquid, lock in odors and release a pleasant scent. 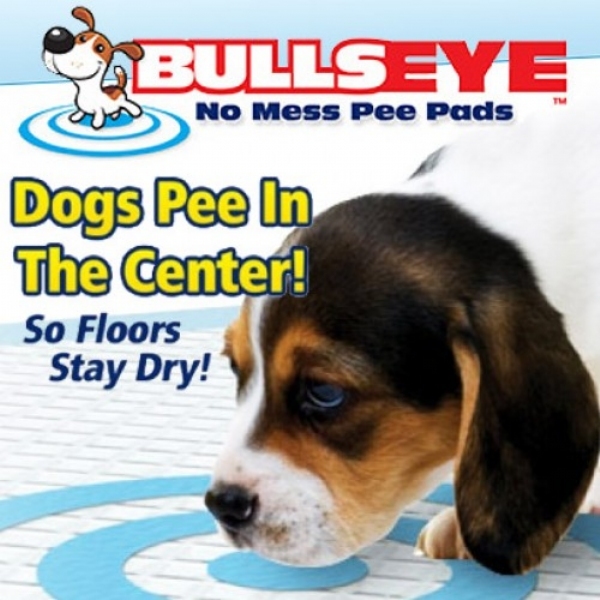 With Bulleye Pee Pads as seen on TV your dog will hit the bullseye every time. No more messy clean up! 20" square. Pack of 30 pads. I have a teacup yorkie and during the nice weather she will go out and sometimes do her business outside, but because she is small and responds very well to Bullseye Wee Wee Pads, I prefer her to be an indoor-trained dog so I don&apos;t have to worry about bad weather and she always uses the pad and I can get at least 3 urine deposits on it before I have to replace it. Excellent product. Put in same area evert time so dog goes to same spot. Praise as soon as you see your pet used it correctly. no more cleaning carpet&apos;s. Tried others dog would not use them. Great for traveling, just wish there was a As seen on tv store closer than 50 miles to me. Would shop there often. I&apos;m very satisfied with the product. My dog is really attracted to these pads. Sometimes she will use other pads, but always seems to use Bullseye. These have been the only type of pee pads that my dog will use. I love them! I am so glad that I can still purchase them on line since I can&apos;t find them in stores any more. my dogs are not drawn to it. These work fairly well when my dog has enough insight to use them. She is very old and has a hard time and goes without notice. These do help. Love these!! They work better than any other pew pads.